What a magical time of year. Yesterday my three girls had their last day of school, followed up by our annual Hello Summer backyard bbq party and today we go right into Ramadan! 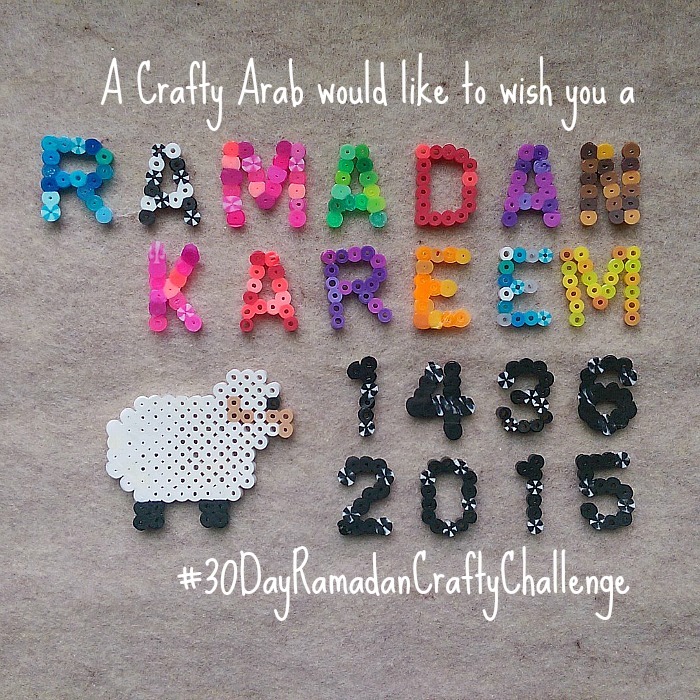 For those new to my blog, I started a 30 Day Ramadan Crafts Challenge back in 2011 when we couldn’t find any Arab or Islamic crafts to learn about the holy month at our local library or book stores. We continued the Ramadan Crafts Challenge again in 2012, 2013, and 2014. I am not a professional photographer and blogging isn’t my full time job (being a mom and this is), so some of the posts were crude at the beginning, but they filled a void. Now there are so many blogs devoted to Ramadan and Islamic crafts, it’s so wonderful to see. As a volunteer art teacher, I see the value of children learning with art at this age because they are visually stimulated. Many have a hard time reading long lessons or sitting for extended periods of time. It’s been shown that at a young age, they should not be doing either, but rather exploring their world through play and fun. Please share these posts. They are also on Instgram and Pinterest. For our fifth annual challenge, the girls and I have been researching craft books and websites the last few months to try to come up with fresh ideas that usually involved supplies found around our home. True, because of my volunteer job, I may have more art supplies then many, but with a little planning, you too can find most our diy tutorials at your local craft store or online. 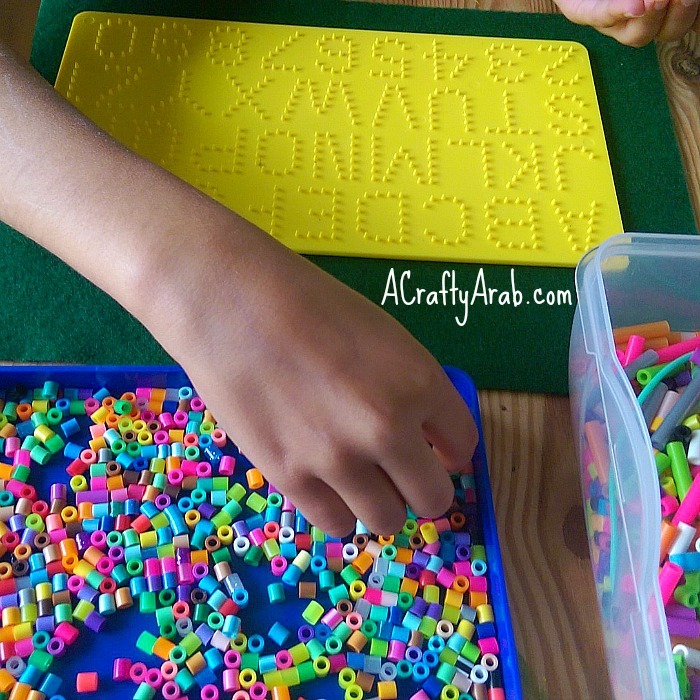 We wanted to start today simple by pulling out our old favorite, the Perler beads, to make our greeting above. Ramadan Kareem means Blessed Ramadan and is a greeting the 1.75 billion Muslims say to each other during this month. Feel free to say it to any Muslims you know. I’m sure it will make their day that you know what time of year it is for them. The numbers are this year on the Islamic and Gregorian calendars. Our supplies are our letters/number board, beads, ironing sheets and an iron. 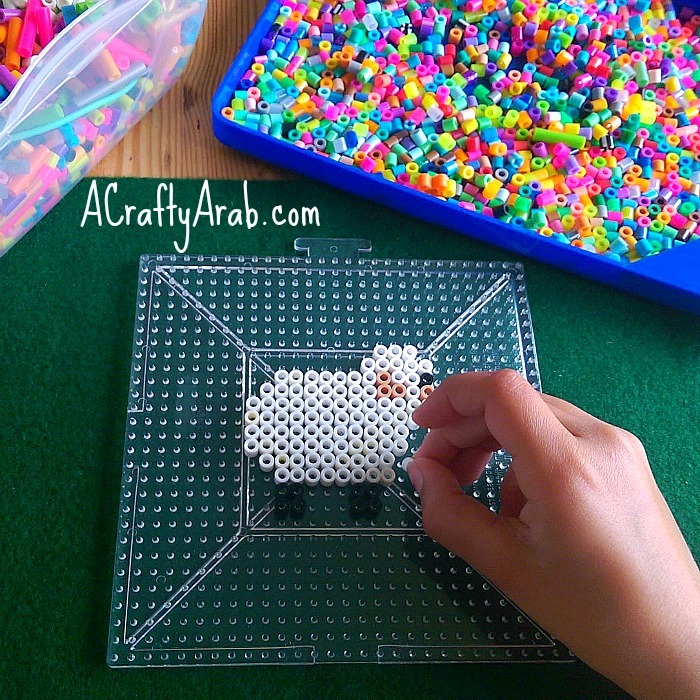 We also made this little sheep and wanted to share how to make your own. You will need 91 white beads, 9 black beads, and 6 beige beads. Start by placing two groups of four black beads together, leaving six blank spaces between them for the legs. Place eight white beads above the legs and follow with working your way up like this: 10 white, 11 white, 11 white, 12 white, 13 white + 1 beige, 8 white + 2 beige + 1 white + 2 beige, 7 white +1 beige + 2 white + 1 black, 5 white, 3 white. You sheep should look like this after you have ironed it. If you had a great time making it, check out these other 99 creative sheep projects. Make sure you come back to check out the rest of the month!